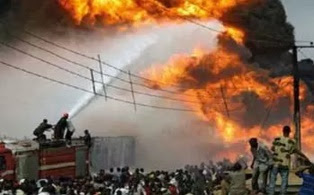 Over N250m worth of goods was lost yesterday at Sango plank market, Ibadan, Oyo State when a fire outbreak razed down over 200 shops. The inferno started around 3pm and was not put out until 8pm. According to traders on ground, only one vehicle belonging to the Oyo State Fire Service was available and once the fire fighters run out of water, they rush back to Eleyele Water Works for a refill which made the situation worse. The fire has however been put out now.